Seating a new needle bearing (Triumph OEM # 57-1606 and 57-1614) inside your transmission case can be a bit of a pain without the proper tool. 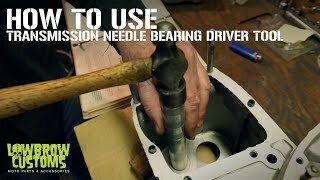 Many people use a socket and extension to pound their delicate new needle bearing in place. Designed by Lowbrow Customs, this aluminum drift solves that issue, protecting your new bearing and your sanity at the same time. Made specifically for installing that new bearing in your pre-unit or unit Triumph 650 or 750 transmission case. Proudly made in the USA. In my opinion, this stand is a "must have" for anyone doing engine work when the the motor is out of the frame. Rebuilding a 650 engine from a T120R Bonneville. This tool worked perfectly to seat the new bearing in the transmission case. Great tool to have if your tearing down and rebuilding Triumph engines. If u r going 2 do it u r self, u need this tool. Much cheaper than buying a lathe. Will last a lifetime! !